The need to conserve marine ecosystems is more and more pressing. The International Aquarium Congress provided an opportunity to share knowledge on marine habitats and species and the issues to be addressed for their protection. 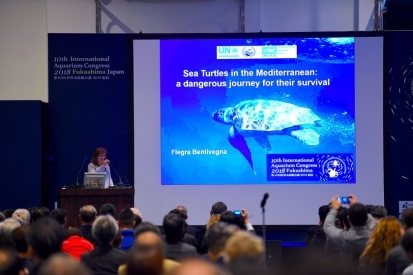 As SPA/RAC consultant, Dr Flegra Bentivigna presented the conservation status of marine turtles in the Mediterranean Sea and the action plan adopted within the Barcelona Convention for their conservation. Mediterranean Sea turtles constantly “sail” in hazardous waters seriously threatening their survival. The Mediterranean is a small sea, very similar to a big salty lake, as well as a serious threat to the survival of marine turtles due to its physical and hydrographic characteristics and the presence of a high number of Countries along its coasts. Out of the three species of sea turtles populating the Mediterranean (Caretta caretta, Chelonia mydas and Dermochelys coriacea), the first two species evolved local populations and are demographically independent from their Atlantic ancestors, that implies a major vulnerability of the local populations compared to those in the neighborhood Atlantic. The pressure of human activities, as bycatch, marine pollution, and in particular marine litter, as well as the use of nesting beaches for recreational activities and climate change have severely impacted marine turtles and therefore immediate actions are required to recover both the biological populations and their habitats. The Mediterranean Sea is very small but, as a big arena, it hosts different ethnic groups, languages, cultures and traditions. Sea turtles during their whole life cross the Mediterranean far and wide without caring of frontiers or geographical limits. The current conservation efforts cannot be successful whether based only on laws and regulations. To protect Mediterranean marine turtles, it’s necessary that all the countries move in the same direction, share knowledge and methodologies. To achieve that, the Mediterranean countries adopted within the Barcelona Convention, a regional action plan defining the priorities for the protection of Green and Loggerhead turtles in 1999. The action plan for the conservation of marine turtles is reviewed and updated every 5 years, on the basis of National Reports provided by the Mediterranean countries and by SPA/RAC reports focusing on regional aspects of the Plan. In order to significantly reduce the mortality of marine turtles, several rescue centers for the cure and rehabilitation of these animals have been set up in strategic points of the Mediterranean. Furthermore, a number of aquariums have also included the cure and rehabilitation of sea turtles among their conservation activities for endangered species, to foster the increasing of wild populations and, at the same time, allow people to have a closer look on these endangered species by raising awareness on their crucial role in our environment. Marine turtles are an excellent group to spread this message. They are considered both as flag species, attracting the interest of a large public and redirecting their attention towards more general marine conservation measures, and umbrella species, inhabiting various habitats. Therefore, the protection measures addressed to these species include protection and conservation of these habitats and associated species.